Well, at the one year mark, we’ve achieved the Net-Zero goal. Usage of 6,673kWh and generation of 6,722kWh. That’s about a fine tuned as you can get. Our final HERS rating was 11. The difference is the way we use the house and how the HERS rating works. Our goals when we started were; A comfortable house; an aging in place floor plan; an energy efficient; with Net-Zero an add on. And house that took on the appearance of a 1930s craftsmen. I have to say all goals have been achieved. We really enjoy the pace and the layout. Because of the materials the house is comfortable: no drafts nor cold spots. The energy efficiently is amazing; in our last house with near the same square footage we used 12,000kW of electric just for plug load and cooling, heating and DHW was from propane. This house used just 6,673kWh for everything. Cost was $501.82 (not counting SRECs pay back) a 90% reduction of energy cost from the last house. The summer’s been good as for energy usage and generation. April’s usage was 457kWh and generation was 435 kWh thus a $6.08 electric bill. Since then we’ve over generated by 1,044. Our electric bill has been $2.98 (the connection fee) for; May, June, July, August, September & October. That’s 6 months with no energy bills and we have 1,044 kWh credit with JC P&L. 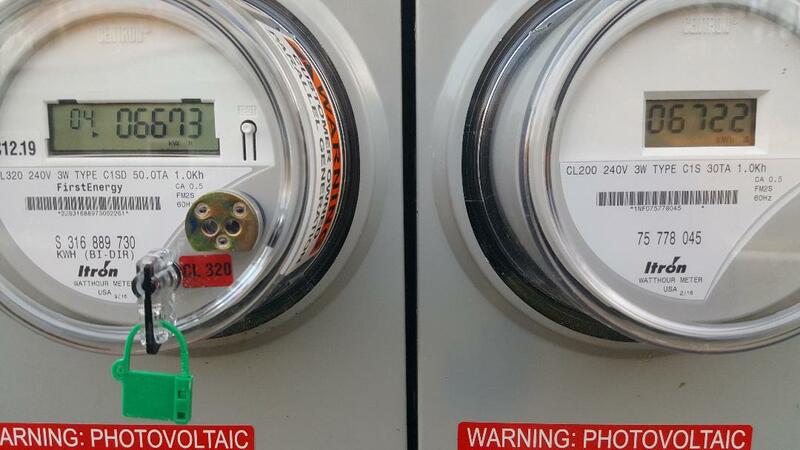 Our year ends with the November Meter Readings, around 11/25. Our full year usage as of Oct 25 was 5,977 kWh and generation 6,493 kWh. I’m estimate a Nov usage of 678kWh and a generation of 434kWh thus ending the year with 6,612kWh usage and 6,819kWh generation. I think we will be in 100kWh =/- of Zero. That’s about as close as one can get. Now our HERS rating is 11, but as I’ve written before the HERS model uses only design perimeters and assumes the a three bedroom 2.5 bath house has 2 adults and X children using electricity and a different rate that just my wife and I use. One of the things I’ve noticed is how many cloudy or partially cloudy day you get. Oct was a good example we had 8 days where we only generated 9kWh or less and one day where we only generated 932Wh. That’s 26% of the days undegenerating. I don’t know how the estimates factor in cloudy days. One estimate shows Oct should have generated 537kWh and actual was 480. Watch for the full year report in early Dec.
I’m still waiting for NJ CleanEnergy to do it’s final review and cut me the check. Any day I hear. It’s Dec 15 and the solar system has been up are producing for a month. It was as easy as I thought it would be and the getting through the Bureaucracy was as problematic as I expected. The SolarEdge inverter and system is amazing. It does all the work. It reports to SolarEdge who ships the data to me via my PC and my phone. See report for today’s generation..